The past week I was officiating a ceremony for a couple who’s interests (well, at least the groom’s anyway) was centered around the sport of softball. With spring coming on and the weather in the Puget Sound area looking better and better by the day, thoughts are frequently turning toward ballfields everywhere. As an illustration I produced a softball from a bag concealed on the platform. Interesting how all the competition, excitement, and social activites stemming from the sport originate from that little ball. Those that play or have played softball remember from our earliest years the most fundemental skill taught to us; “keep your eye on the ball.” Whether beginner or season veteran of the game, it is imperitive that we focus on this most important element. Both batting and fielding are dependent on it. Lose sight of the that little globe and you know what happens; not getting a square hit or even missing the ball completely at the plate, or seeing the ball skip over your glove as a fielder. There are plenty of distractions as well; as a hitter, thinking more of taking the first steps toward base or where you want to place the hit, or as a fielder seeing the runner out of the corner of your eye or trying to begin your throw before you actually have the ball firmly in your glove. In marriage it’s so easy to forget over time the most important elements of our relationships and “take our eyes off of the ball.” When we are first dating and even into the honeymoon phase of our marriages, we are concentrating 110% on each other’s desires and needs, connecting on an emotional level. We can remember those conversations on the phone long into the night, or the letters expressing how deeply we felt for one another. Over time and as life takes its course through the years, the natural pattern is for us to become more comfortable (nothing wrong with that in itself of course – it can also be a good thing! ), and we can lose the intensity and passion of focusing on these important things. The distractions of life (and what marriage doesn’t have them), with a growing family, personal changes and vocational challenges, can also cause us to neglect those things that were once very important in our relationships. All longer-term relationships have faced this dynamic in one way or another. The key is to get back to basics; to once again revisit those things that connected you on the heart-level in the first place – to simply take the time to “get to know” each other again. Over time we change – we won’t be the same 1, 5, 10, or 50 years from now. The same goes for our spouse – once again, discover the “keys” to their lives – find out what makes them come alive, their passions, goals, desires. A good start is simply getting a cup of coffee and spending time sitting in front of the fire, or going out on a date. Staying connected is a matter of the will – make a conscious decision to set aside the necessary time. Keep your eyes on the ball – I know you can do it! 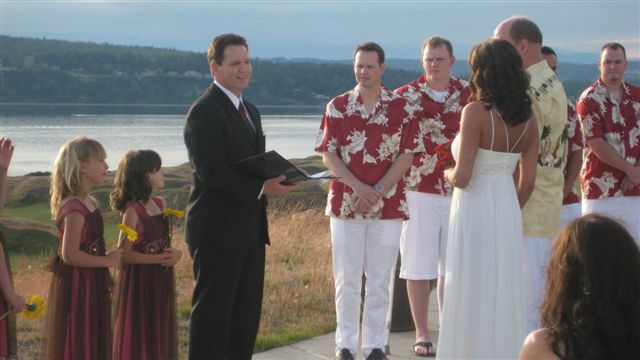 I was officiating a wedding at Salish Lodge in beautiful Snoqualmie Falls last night (a beautiful wedding venue! ), and shared something with the bride and groom (and guests) that I believe is a key to a long, satisfying marriage relationship. In this day and age of computer technology, we all know the importance of not only installing the original computer programs, but keeping these programs regularly updated to insure proper performance. How many times have we had problems down the road because we neglected to regulary check and download the latest updates and versions or simply didn’t want to pay for these. The same is true of the marriage relationship. When first married, it is almost as if we install the “marriage 1.0” version. But over time, we change, we grow, we enter different seasons of life. A marriage needs to change and grow as well to keep in step with these changes – and contrary to what some may think, we don’t do this automatically. We must, so to speak, install “marriage 2.0,” “3.0,” and so on. It takes constant effort and sensitivity. My wife Cindy and I are in our 29th year of marriage, and we have found this to be so true in our relationship. There have been times that I know I have neglected to focus on important “updates” that could have greatly improved our marriage, and these actions (I should say inactions) almost caused a total systems crash! This past weekend I officiated a wedding celebration for a wonderful couple who first met and became sweethearts during their high school years, but life took them different directions until mid-life brought them back together again. Thei r wedding was held at Coumns on the Park in Bellevue. Columns on the Park is a lovely bed and breakfast with “Italian Sensibility” situated in the Beautiful Lakeland Hills area of Bellevue, down a quiet residential lane. Heidi Behrens-Benedict is the Innkeeper and owner since the early 70’s. The Inn features a lovely Italian architectural exterior, complete with stately columns and lovely gardens that provide a wonderful backdrop for smaller, more intimate outdoor wedding celebrations. Heidi also provides her own “cake and coffee” receptions straight from her kitchen, and makes the most wonderful tasting cakes! Columns on the Park would make a great location for not only intimate weddings but busniess meetings and romantic getaways. Well worth checking into! My wife and I, along with a number of other vendors, were treated to touring a brand new wedding venue the other evening that is sure to capture the attention of many brides in the future; Moon Mansion. Special thanks to the event orgainizer Nelliena Moetului, wedding coordinator at Snoqualimie Ridge Golf and Country Club, and Moon Mansion owners Paul and Heidi Moon. Situated on a secluded 8 acres in the North Bend countryside, this 7200 square foot luxurious mansion comes complete with a two-story-tall stone pillar porch, a magnificent pillared marble entryway, and an amazing grand double marble and iron staircase (to die for!). The house features 6 bedrooms, 4 bathrooms, and sleeps 20 to 26 people. Also part of the amenities are a 1000 square foot French Country Kitchen, spacious dining room with huge table, media room with full-size movie screen, and utility room for laundry. The grounds feature a 1 acre garden in the back of the house that would be perfect for a smaller wedding (the view from there is amazing! ), and a small guest house. Moon Mansion would be an ideal venue for weddings, family reunions, wedding showers, company executives retreat, or time away with friends in the natural beauty of the northwest. You can find out more by logging on to www.themoonmansion.com. One of the “side benefits” of doing weddings is that they take me to some great venues and locations that offer excellent food, great views, and interesting people to meet. I really enjoy taking road trips (I love to drive and explore new places) and seeing the countryside; I’m constantly discovering new areas of the northwest that I never knew existed or have heard of but not yet visited. Canlis restaurant in Seattle is one such place – I just came back from an evening wedding event there. I had heard of the place before but had not been a guest until today. The room that the ceremony was held in was a smaller, very comfortable space for a table of about 25 (complete with fireplace), featuring an excellent view eastward over the northern portion of Lake Union toward Gasworks Park and beyond. I felt like I was being pampered from the moment I arrived (valet parking, of course! ), and there were waiters and attendents waiting to take your every request, and they took drink orders as we arrived. I did not stay for dinner after the ceremony, but as I was walking out a waiter offered me a crab puff appetizer (yum!) and I saw some juicy looking steaks sizzling on a grill. I had a great time at Canlis and will hopefully return in the near future to either perform another ceremony there or be a dinner guest myself – probably one of those “special” places for birthdays and anniversaries. I recommend you visit as well.